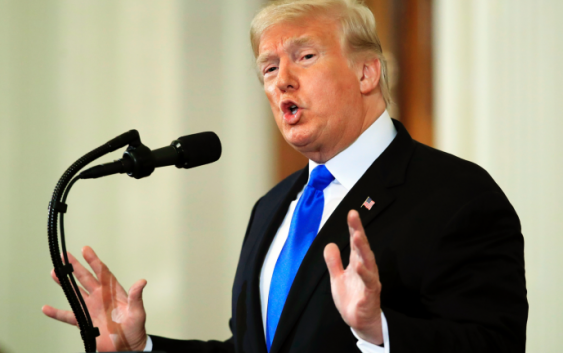 Fresh off the GOP’s loss of the House, President Donald Trump is fudging the success of a “booming” economy and overstating the impact of his campaigning on the midterm elections. On the economy, Trump asserted that U.S. growth under his watch has been unprecedented. In fact, it was surpassed just four years ago during the Obama administration. He also minimized the trade threat from China and claims a U.S. steel industry renaissance that isn’t really happening. And speaking before Veterans Day, Trump claimed premature success in achieving “more for the vets than any president,” citing an expanded health care program that has yet to be fully paid for or take effect. TRUMP, on the message taken from Tuesday’s elections: “I think the results that I’ve learned, and maybe confirm, I think people like me. I think people like the job I’m doing, frankly. Because if you look at every place I went to do a rally … and it was very hard to do it with people in Congress because there are just too many … but I did it with the Senate. I did it with (Kentucky Rep.) Andy Barr, as you know. And he won.” — news conference Wednesday. Two Republicans who closely embraced Trump in their Senate races — Montana’s state auditor, Matt Rosendale, and West Virginia’s attorney general, Patrick Morrisey — lost to Democratic Sens. Jon Tester and Joe Manchin, respectively. Trump had visited Montana four times and West Virginia three times to rally voters. Also losing Tuesday were Republican Sen. Dean Heller of Nevada, defeated by Democratic Rep. Jacky Rosen, and Leah Vukmir, a GOP state lawmaker in Wisconsin who lost her Senate race to Democratic Sen. Tammy Baldwin. Trump campaigned for Heller in Nevada on Oct. 20 and for Vukmir in Wisconsin on Oct. 24. TRUMP: “Fifty-five is the largest number of Republican senators in the last 100 years.” — news conference Wednesday. THE FACTS: His party didn’t win 55 Senate seats Tuesday. Republicans held 55 seats in the Senate in 2005-2006, as well as 1997-2000, according to the Senate historian’s office. After Tuesday’s elections, Republicans will hold a 51-46 edge, with races in Florida and Arizona too close to call. A special election in Mississippi has advanced to a runoff election on Nov. 27 between Republican Sen. Cindy Hyde-Smith and Democrat Mike Espy. That means 54 Republican seats if those three races all break the GOP’s way. TRUMP: “America is booming like never before. … In terms of GDP, we’re doing unbelievably.” — news conference Wednesday. THE FACTS: The economy is healthy, but it’s not unbelievable or unprecedented. It’s also not clear what he means in claiming the nation’s “greatest economic success” ever. TRUMP: “And our steel industry is back. Our aluminum industry is starting to do really well. These are industries that were dead. Our miners are working again.” — news conference Wednesday. The steel industry has added jobs at a faster rate than the economy as a whole since Trump’s inauguration, though all the gains occurred before the administration imposed tariffs on steel imports in March. Still, the rebound has hardly restored steel to its former glory. Meanwhile, not many miners are working again. Coal mining jobs have increased just 1,900 to 52,600 since Trump’s inauguration. That’s also a lot lower than the roughly 70,000 coal mining jobs that existed as recently as 2014. TRUMP: “China got rid of their ‘China ’25’ because I found it very insulting. I said that to them. I said, ‘China ’25’ is very insulting, because ‘China ’25’ means, in 2025, they’re going to take over, economically, the world. I said, ‘That’s not happening. '” — news conference Wednesday. THE FACTS: There’s no evidence China has abandoned its economic plan. Trump is referring to China’s “Made in China 2025” plan, under which that country’s government aims to develop world-leading companies in robotics, semiconductors, electric vehicles and other advanced technologies. It’s a sore point between the two nations because the United States and other countries argue that China is using unfair tactics to achieve those aims, such as forcing U.S. companies to share technology and providing government subsidies. Chinese officials have played down the plan in recent months because of the international criticism. But there’s little sign they have “gotten rid of” the plan. Because China sees the plan as a key step in the development of its economy, many observers worry they are unlikely to scale it back, which suggests U.S.-China trade fights aren’t going away anytime soon. TRUMP: “I’ve done more for the vets than any President has done, certainly in many, many decades, with Choice and with other things, as you know. …If you look at Choice — Choice alone — I mean, just take a look at what we’ve done with Choice.” — news conference Wednesday. THE FACTS: He’s taking premature credit for improvements that will take years to see full effect in regards to the Veterans Choice program. Also important to the program’s success is an overhaul of the VA’s electronic medical records to allow seamless sharing of medical records with private physicians, a process expected to take up to 10 years. VA Secretary Robert Wilkie has said full implementation of the expanded Choice program is “years” away. TRUMP, on keeping health premiums down and covering people with preexisting medical conditions: “What we’re doing, if you look at the Department of Labor also — (Health and Human Services) Secretary (Alex) Azar, what they’ve done. They’ve come up with some incredible health care plans, which is causing great competition and driving the prices right down.” — news conference Wednesday. 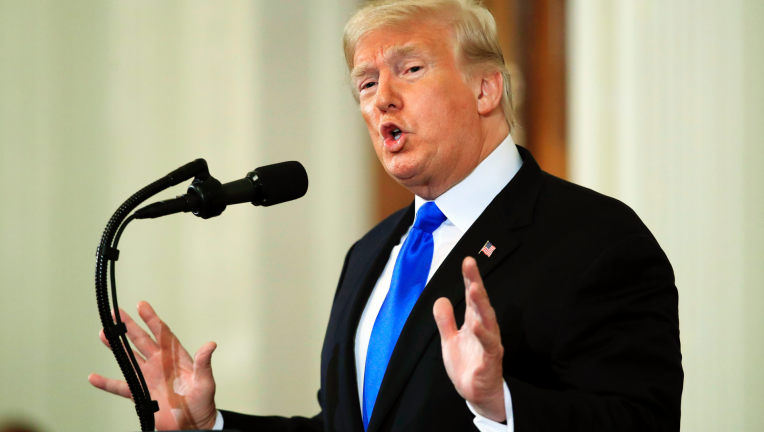 THE FACTS: He’s glossing over the limitations of his administration’s new health care options, which offer lower premiums than comprehensive plans such as the Affordable Care Act but also cover less. The availability of Trump’s short-term health plans also is not going to “drive down” prices of the Obama-era overhaul or comprehensive plans, but may increase premiums for robust coverage if fewer healthy people take it as a result. Short-term plans don’t have to take people with medical conditions or provide benefits such as coverage for maternity, mental health, prescription drugs and substance abuse treatment. Association health plans do have to accept people with pre-existing medical conditions, but they don’t have to cover the full menu of 10 “essential” kinds of benefits required by Obamacare. Gary Claxton of the nonpartisan Kaiser Family Foundation says short-term plans may turn out to be more costly than Trump administration officials suggest. The plans now cover up to 90 days, but if insurers expand them to offer up to 36 months’ coverage, the companies will be taking on more risk.